This page last updated on Wednesday 5 November 2003. Hewlett-Packard has seriously geared up to make some new calculator models. Not only that, but they are committed to keeping RPN alive and returning to the high-quality construction they used to be famous for! 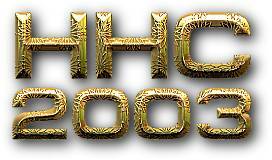 HP graciously accepted our invitation to attend HHC 2003, and showed off their new models. Everybody got a chance to play with each of them, and ask the folks from Hewlett Packard all the questions on their minds. Two attendees won a brand-new hp49g+, the other models were won by other lucky attendes, and everybody won door prizes of all kinds. A fun and informative weekend was had by all, leaving the HP Handheld Users Community with "A New Hope" of a bright future for HP programmable calculators.